Here are a few of the great Halloween finds from Encores. This dress still had the tags on it! So cute! Tiger Lily's costume and Justice Sherpa boots and Tinker Bell's shoes all great finds. Super fun Super Girl costume. We hope everyone has enjoyed all of their great Halloween finds. Thanks everyone for signing up to receive our emails. If you have not signed up please take a minute to do so. If you have pictures of you or your children in Halloween outfits and/or costumes you bought at the sale please email them to me (hhood79@gmail.com) by Thursday at 8pm. Don't Miss Our Blog Kick Off! My name is Heather and I am excited to blog for Encores. I have shopped the South sale since 2008. I started consigning and volunteering in 2009. I love it and always look forward to the sale. I get about 95% of Hannah and Hunter's clothes from the sale. I have also started shopping for myself and love finding name brand clothes for great prices. We are having a blog kick off and we need your help! Would you like to win a $10 gift certificate to use at the Spring sale? All you have to do is sign up to follow our blog by email. We would love for you to then tell all of your friends to sign up as well. Share our blog on your Facebook and Twitter accounts. You have until next Sunday, October 27 at 2pm to sign up to follow our blog and be entered for the $10 gift certificate. We will announce the winner here and on our Facebook page. See the post below about how to make sure you have verified that you are really following us. Are you following our blog? We had some technical difficulty, so we want to make sure you are really signed up to follow our blog. 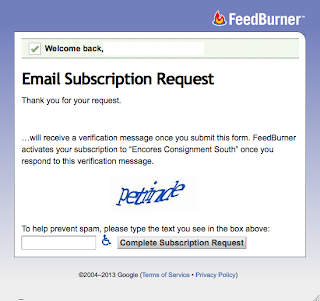 When you enter your email address, to the right, and click submit you will see a screen like this. 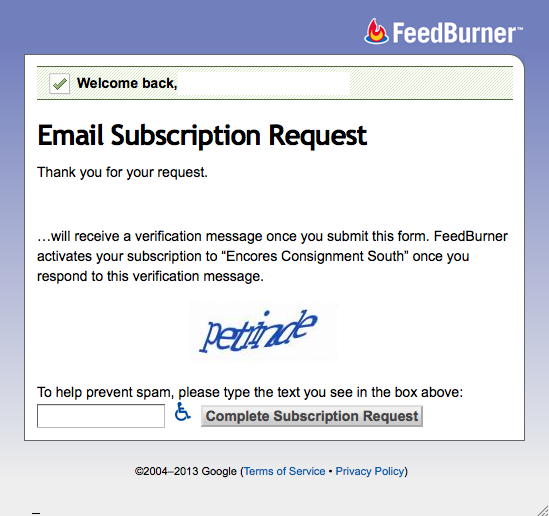 Enter the word it gives you and click complete subscription request. Then you will see this screen. 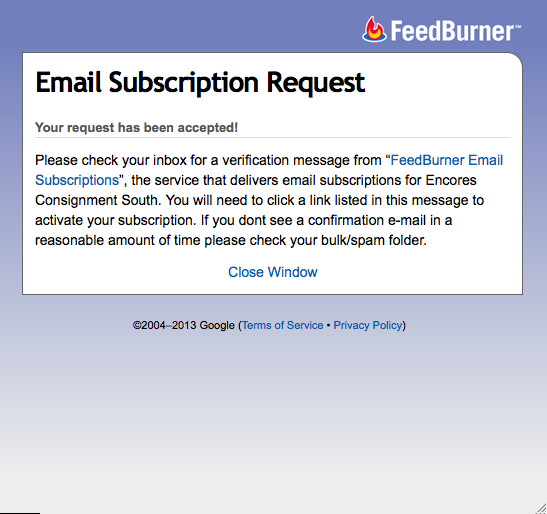 Check your inbox for an email that will look like this. Click on the link in the email and you will get the screen you see blow. If you did not go through these steps then you are not signed up. You have to verify your subscription to be entered in the drawing for the gift certificate. Remember you have until Sunday, October 27 at 2pm to sign up to follow our blog. Remember it is not too late to register for the Clarksville Toy Sale. Visit their site to register and for more information.